Wasabi is a plant native to Japan that is commonly referred to as Japanese horseradish. Its stem is commonly used as a condiment for Japanese dishes, its most famous use being an accompaniment for sushi. Although many sushi restaurants in North America claim to serve real wasabi with their sushi, it is a well known fact that most wasabi being served is actually a mix of horseradish, mustard and food coloring. Aside from deceiving customers into thinking they are eating real wasabi, by using artificial dyes such as Yellow 5 they are also exposing their customers to benzidene, which is a known human carcinogen. It is estimated that only 5% of Japanese restaurants around the world actually contains the root of Wasabia japonica (the wasabi plant). It is very important to be able to tell the difference between real wasabi and the impostor used by most sushi places, as the taste, texture and health effects of each of these foods are very different from each other. Aside from having a taste and texture that is much different from fake wasabi, it also provides us with a variety of unique health benefits. One study published in the journal Advances in Pharmacological Sciences found that a major bioactive compound that is naturally found in wasabi, called 6-(Methylsulfinyl)hexyl isothiocyanate (6-MSITC), has several health beneficial properties. One of these properties is its ability to block causes of inflammation such as inflammatory cytokines and other inflammation-promoting factors. This shows that wasabi acts as an effective anti-inflammatory. Several other studies have also shown wasabi to have antimicrobial and appetite enhancing properties. Its appetite enhancing properties make it a great side dish if you want to enjoy more of your main dish, and the fact that it is an antimicrobial can help prevent the possibility of harmful bacteria spreading when consuming raw fish. One study on rats even found that the active compound in wasabi was able to suppress the spread of stomach cancer. Now that you know all of the health benefits that wasabi provides, I’m going to tell you everything you need to know about distinguishing genuine wasabi from the fake stuff. First off, real wasabi is a freshly ground root of the wasabi plant that is packed together into a small mound that is then served with your meal. This means that real wasabi does not have the same texture of paste that fake wasabi does. Instead, it resembles a clump of finely ground root. 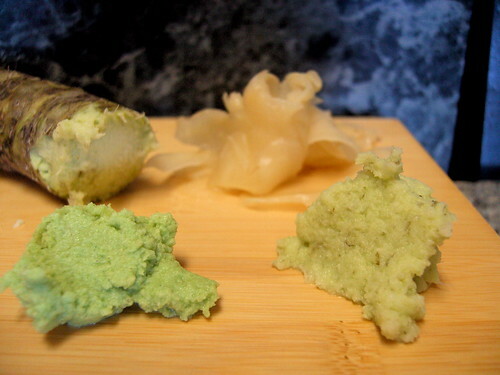 Real wasabi is also much lighter in color than fake wasabi. This is because the root of the wasabi plant is generally a lighter green than the dye used in fake wasabi that is meant to mimic it. Another important factor that distinguishes real wasabi from fake is that real wasabi needs to be served fresh, as it looses its flavor and intensity within the first 15 minutes of it being grated. Some restaurants that serve real wasabi will tuck it in between food to retain its freshness in between the time it is prepared in served. It is important to note, however, that even fresh wasabi is not as strong as fake wasabi. 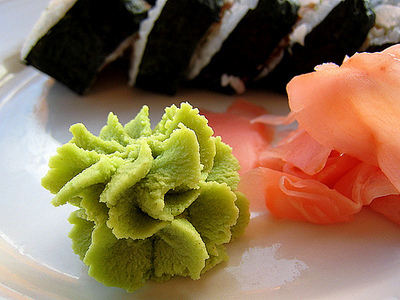 The signature tingling-in-the-nose feeling you get when consuming wasabi is generally a sure sign that it is fake. If you want to get real wasabi, you generally have to go to very high-end Japanese restaurants or specialty grocery stores. This is due to the fact that, outside of Japan, wasabi is very hard to cultivate, making it very expensive. If you go to all-you-can eat sushi then you are likely not going to get real wasabi, as most restaurants can’t afford to give it out at such a high rate. Real wasabi is generally reserved for customers who purchase sushi à la carte, or from the dinner menu, which is generally more expensive. For more fake foods that you probably thought were real, click here.